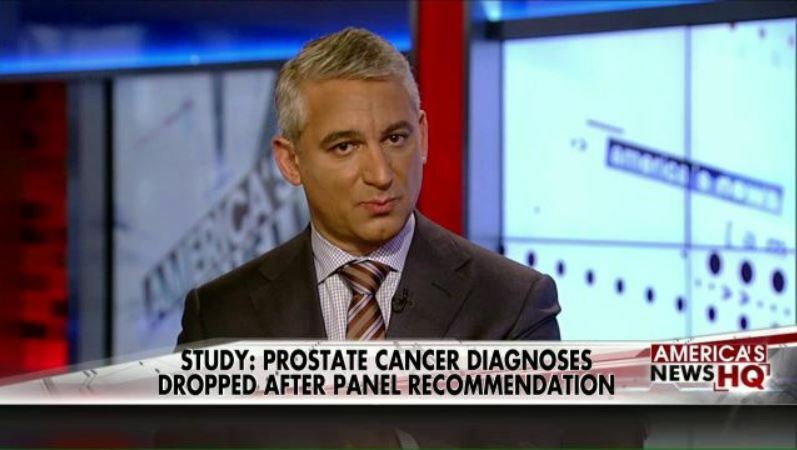 In an interview with FOX News, Dr. David Samadi shares his opinion on why the recommendation against PSA testing could lead to many young men being diagnosed with prostate cancer when it’s too late. Prostate cancer affects 1 in about 7 men and, according to the latest statistics from the American Cancer Society. A new study shows a significant drop in the number of new diagnoses and the author suggests a controversial recommendation from a Government task force may be behind the decline. Doctor Samadi is the Chairman of Urology and Chief of Robotic Surgery at Lenox Hill Hospital in New York. Dr. Samadi, this looks like it would be good news, but you say not necessarily. Why is that? Dr. David Samadi: This is, actually, a very alarming news and we want men out there to understand that PSA screening can save lives. As a result of the guidelines that the US task force brought in October 2011, we saw a year after that there was a reduction of these intermediate and high-risk prostate cancers. 28% lower risk of detections. We are not seeing those patients and that can actually lead to the death of these men. Because the guidelines lead to less testing? Dr. David Samadi:That’s right. 28% lower finding of intermediate prostate cancer and 23% of those patients with high risk, we’re not seeing them. This decline is going to catch up with us and we’re going to see young men that have many years ahead of them that are coming up with metastasis, which is spread of cancer to bone and affect their quality of life and also die from prostate cancer. As you know, still 30,000 men die in this country from prostate cancer. It’s the 2nd leading cause of death in this country and the US Task Force is not helping us. This was a huge mistake, there are debates going on, but now we see that the numbers are coming up. New studies from Vanderbilt, published in the Journal of Urology, that as a result of not screening men, we’re going to be seeing a lot of them dying of prostate cancer. Prostate cancer is a curable disease, but it’s a silent killer: there are no symptoms, so men out there need to go out and get tested and talk to their doctors about this. Don’t ignore this. Why did they change the guidelines? Dr. David Samadi: The idea behind this is that there are a lot of cases of lower risk prostate cancer that when you treat them they can lead to impotence and incontinence. But as a result of coming out and giving great deed to this PSA test and then saying “don’t get tested”, men are confused now, nobody knows what they have to do and they’re not going to get screened. When they did the same thing to women and they said “don’t get mamogrammed” all women came out, there were demonstrations. Women are very good in going to screenings. Men, we think different. When somebody tells us “don’t screen”, we sort of say “honey, don’t worry, I’m perfectly fine”. That’s dangerous. At the same time, we came up with the site www.prostatecancer911.com. If you are diagnosed with prostate cancer, you have questions, if you want to join us to fight back and bring awareness, go to prostatecancer911.com and we’re able to help you for free. Take this moment to clear up some of the confusion, then. What do you recommend in terms of testing, who should get tested, at what time? 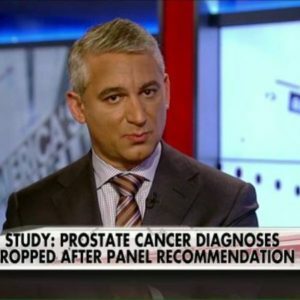 Dr. David Samadi:I think that if you’re high risk, especially African-American, or have a family history of prostate cancer, please get a baseline PSA at the age of 40. Irrelevant with what the US Task Force is saying. The USTF needs to wake up, we see more and more young men coming with metastasis. This is dangerous. Get a baseline PSA at 40 and have a conversation with your doctor, whether you need to continue every year or go again at age 45. In terms of testing, there’s a new level of testing, a new blood test. Dr. David Samadi: Glad you brought it up. As we get more sophisticated, as we bring in more genetic testing, we can distinguish between the low-risk prostate cancer and intermediate and high risk. That’s when we can say you don’t need to be screened for the next 5 years, but you need to go in, either get a treatment, get a biopsy, etc. This whole bold statement that screenings can cause complications and then give them great deed, does not help anybody and it was a huge mistake with which we’re dealing now. I also want to talk to women, because they’re in charge and make 70% of healthcare decisions: get your men tested. We don’t need any more young men dying of prostate cancer.